Just came across a good article on DIY-Boat Owner magazine about protecting your boat - they give useful advice for avoiding hull damage caused by your uncovered fenders, especially during the winter. The solution, says the article, is to get or make cloth fender covers. Left uncovered, your fenders can wear away at the finish on your hull over time. As the fenders age, especially in salt water, their surfaces become rough and will scratch your hull. 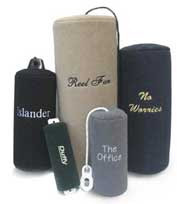 BoatNameGear has the solution to protect your boat with our washable, soft cloth fender covers. These fender covers cost only a fraction of the price of the actual fenders, and include your boat name embroidered on them for no additional cost. Check the size of your fenders and then visit BoatNameGear to order your custom fender covers now.